Diamond & Emerald Three Stone Ring. A fine Emerald cut Emerald. 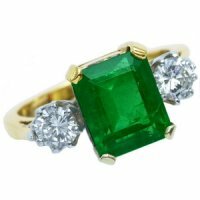 An Emerald Engagement ring. A majestic Octagon Emerald and Diamond 3 stone ring. The fine octagon emerald weighing a substantial 3.74 carats, set in 18 carat yellow gold 4 claw setting, 2 brilliant cut diamonds glitter at it's shoulders, weighing a total of 0.61 carats, set in 18 carat white gold. 18 carat yellow gold shank. 18K - 750.